Safe ketchup is fairly easy to find. Most ketchup sold in the U.S. are considered gluten-free to at least below 20 parts per million. However, there are a couple of exceptions to this rule. If you follow the gluten-free diet, you shouldn't simply grab any ketchup off the shelf and assume you'll be fine. While I haven't found anyone who adds a gluten grain product to ketchup, there are several that may be subject to gluten cross-contamination in processing. I note these below. In addition, some who eat gluten-free react to distilled vinegar that's made from gluten grains. In the U.S., companies are supposed to disclose vinegar made from wheat on their labels. However, this rule does not apply to condiments. Therefore, manufacturers can (and do) use wheat-derived vinegar to make their ketchup without disclosing that fact on their labels. In the list below of ketchup and their gluten-free status, I've included the source of the vinegar if I've been able to obtain it from the manufacturer. If you're one of those who reacts to vinegar distilled from gluten grains, you may want to stick with one of the brands that uses a non-gluten grain source for its vinegar. Annie's Naturals Ketchup. Annie's, which makes a variety of products for the gluten-free market, tests this organic ketchup to 20 parts per million. A company consumer representative says that Annie's products will disclose on their labels if they're made on shared equipment or in a shared facility with wheat, but not with barley or rye. Annie's says the vinegar in the ketchup is derived from corn or from beets, not from wheat. French's Ketchup. French's ketchup is gluten-free (to less than 20 parts per million) and corn syrup-free, too. It also steers clear of preservatives and artificial colors and flavors. The vinegar used in French's condiment products can be derived from wheat. Heinz Ketchup. Heinz, which makes the most popular ketchup in the U.S., is considered gluten-free to 20 parts per million. For those who are sensitive to vinegar made from gluten grains, Heinz reports that its distilled vinegar is made from corn, not wheat, sources. Hunt's Ketchup. Hunt's ketchup products are produced by ConAgra Foods Inc., which has a policy of disclosing any gluten-containing ingredients specifically on the food's label. That being said, ConAgra does not consider Hunt's ketchup to be gluten-free. Instead, the company states that all varieties of Hunt's ketchup "do not contain added gluten," but aren't tested to see if they're legally gluten-free. In addition, the vinegar used to make Hunt's ketchup can be derived from gluten grains (primarily wheat). Muir Glen Ketchup. Muir Glen is owned by Small Planet Foods, which in turn is owned by General Mills. Muir Glen's products do not carry gluten-free labels, which means General Mills does not consider them to meet gluten-free standards. A Muir Glen customer service representative told me that the company will disclose gluten-containing ingredients on product labels, and won't hide them under "natural flavors" or "spices." However, the rep adds, "if there are no gluten-containing ingredients listed in the product ingredient label, but the product does not make a gluten-free claim, it is because we cannot fully ensure that this product is gluten-free." Muir Glen would not disclose to me the source of the vinegar it uses, saying only that it is "highly distilled." Organicville Ketchup. As would seem obvious from the company name, Organicville makes organic products, including ketchup. The company is certified gluten-free by the Gluten-Free Certification Organization, which requires testing down to below 20 parts per million. Company founder Rachel Kruse tells me that the vinegar used in Organicville ketchup and other products is certified gluten-free and is derived from either corn or cane. Walden Farms Ketchup. Walden Farms specializes in "calorie-free" low-carb products that also are considered gluten-free to 20 parts per million. According to the company, the ketchup contains "no calories, fat, carbs, gluten or sugars of any kind." 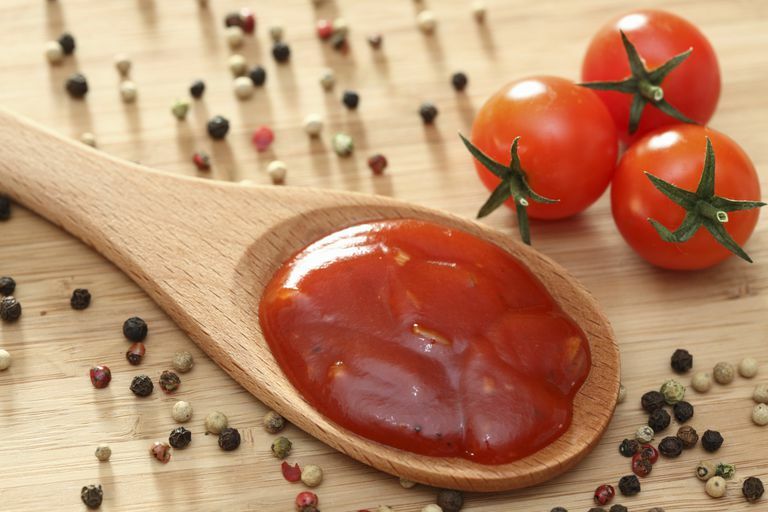 The company's ketchup is made with tomato paste plus a mix of two different vinegars (apple cider and white distilled), spices, gums, and flavorings. If you're particularly sensitive to trace gluten, you may want to consider looking for a ketchup that's certified gluten-free; there's at least one available. Multiple grocery store chains produce their own store brand ketchup, many of which actually are manufactured by outside companies. You'll need to ask your preferred supermarket whether its store brand ketchup is considered gluten-free; fortunately, most stores these days have lists of gluten-free products. Be aware, though, that most of these are tested only to 20 ppm. One final note: carefully choosing a gluten-free ketchup won't do you any good if that ketchup gets contaminated by a knife that's been used on gluten bread. I recommend buying squeeze bottles of ketchup and other condiments, where available (most come in squeeze bottles these days). Avoid cross-contamination by carefully setting up your shared kitchen.